Current employment settings and duties of program graduates. A survey of kinesiotherapists registered within 1987-1990 and published by Greninger et.al. in Clinical Kinesiotherapy, Volume 46, (3),1992, revealed that Registered Kinesiotherapists were employed in Department of Veterans Affairs Medical Centers, public and private hospitals, sports medicine facilities, rehabilitation facilities, learning disability centers, schools, colleges and universities, private practice and as exercise consultants. 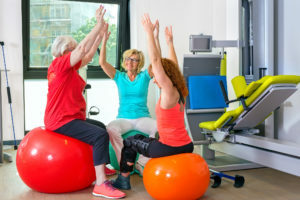 The types of treatments carried out by kinesiotherapists focus on, but are not limited to therapeutic exercise, ambulation training, geriatric rehabilitation, aquatic therapy, prosthetic/orthotic rehabilitation, in home exercise therapy, psychiatric rehabilitation and driver training. ** The AKTA does not guarantee employment for it’s membership.